The Crusaders sent Richie McCaw and Dan Carter to Super Rugby's valhalla in fitting style, claiming a bonus-point victory with a performance that belied their failure to make the finals for the first time since 2001. The result, meanwhile, ensured New South Wales Waratahs top the Australian conference at the expense of the Brumbies, who claim the final post-season berth. Crusaders captain Kieran Read said the winning performance was "appropriate" given "the type of guys [McCaw and Carter] are. "They're living legends," Read said of his illustrious team-mates. McCaw said he "just wanted to play tonight with a smile" and "to finish with a performance like that against the old rivals brings a real good smile". Carter said it was "good to finish on a win, it was a frustrating year but to finish on a win in Canberra is satisfying". The Brumbies had to defeat the Crusaders to have a chance to overtake the Waratahs on top of the Australian conference, and they opened the scoring inside three minutes with the first of their three tries from rolling mauls, through David Pocock, his eighth of the season. 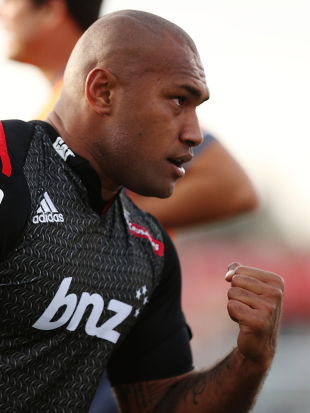 But the Crusaders hit back moments later, after a sensational interception from Read, with Nemani Nadolo powering over in the left corner to become first player in franchise history to score in five consecutive games. Carter landed two penalty goals on either side of a Brumbies goal from Christian Leali'ifano, and they extended the lead to 16-10 on the half-hour through Matt Todd - minutes after the flanker had lost the ball over the line. Nadolo sent the visitors to the sheds with an 11-point margin when he scored a superb individual try just before oranges, grubbering ahead and then keeping himself inside the white line for try No.2. Pocock had already left the field for a concussion test that he failed, and the Brumbies' hopes took another hit when Jesse Mogg was sin-binned for a deliberate knock-down. They had a glimmer of hope when Jarrad Butler scored from another rolling maul, after Sam Whitelock had been yellow-carded for collapsing a maul, and they dotted down again in the 66th minute - a converted penalty try off yet another rolling maul - to close the gap to 27-24. But the visitors would not be denied, awarded a penalty try of their own after McCaw had piloted a tremendous driving maul. The result confirmed the Brumbies would be on the road next week in the first weekend of the finals. "We'll dust ourselves off and go again next week," Brumbies captain Stephen Moore said after his 100th game for the franchise. "We've done it before and we're a chance." "We had a crack but we just weren't good enough tonight ... they turned us around all night". Coach Stephen Larkham, meanwhile, said that Pocock should be fit to play next week after failing his concussion test. "He's on a six-day return to play protocol, but he should be fine," Larkham said. "He can partake in training on the Wednesday, so I think he'll be alright." Larkhan paid tribute to the Crusaders, saying they "had a fantastic game tonight and I thought they were on fire", but he thought the Brumbies matched them "apart from a couple of lucky tries and some poor discipline". "There's a few things we can learn from the game, but I guess the beauty of it is we still get another crack this year." Crusaders coach Todd Blackadder said he was proud of his side to end the season - and Carter and McCaw's Super Rugby careers - on a high, despite missing the finals for the first time since 2001. "This has probably been building the last three weeks," he said. "We had a good game plan and a good strategy, led by 'Reado '. The boys really fronted today and I'm really proud of the effort."